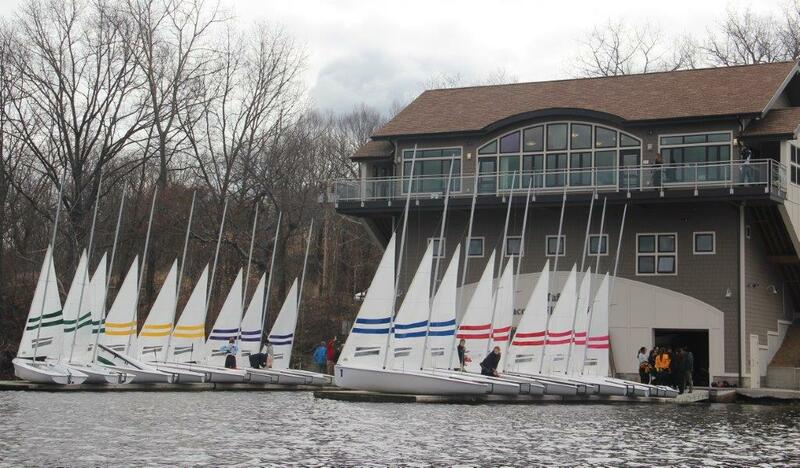 A new era has begun at Mystic Lake, home of the Tufts University Sailing Team. Just purchased is the sixth iteration of Larks class dinghies, except these are not ordinary Larks. For the first time Larks are being produced in the United States at Whitecap Composites in Peabody, MA, just 15 miles from Tufts. Builders of about 80 college dinghies for MIT, with new dinghy fleets at Cornell, Eckerd and elsewhere, Whitecap has produced 24 gorgeous “Turbo Larks” Why turbo? These are not the class legal Larks so popular in England. These are ultra-light, ultra-stiff, and oversized canvassed high performance college dinghies. Designed for young adults, not junior sailors, Turbo Larks are light air upwind machines capable of moving at, or higher than the true wind speed in light air. In breeze these Larks are definitely turbo-charged. Hulls and decks were hand made with expert craftsman, are resin infused and bonded to a Soric core. The result is a lighter, stiffer, more consistent structure for simply a better boat. Doyle Sailmakers in Swampscott, MA also hand craft locally matching or even improving upon the long lasting sails they made back in 2010. The enormous “fat-head” mainsail powers up the boat as a spinnaker would downwind but twists off in big breeze upwind for any weight combination. The jibs were increased in area as well. Selden Spars of Charleston SC, provided tapered aluminum kappa section masts for power and weight saving along with ultra-light carbon booms. 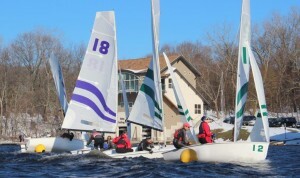 Unique to college sailing features on these Turbo Larks include boom vang and Cunningham controls led back to both sides in between skipper and crew. Rudders are cassette style and centerboards are now composite, unlike the old plate aluminum boards of the past. The best feature of all might be the hull design which has passed the test of time since 1967. The deep “V” bow and narrow waterline allows for phenomenal light air upwind speed and feel. The flare to the rail puts hiking power where it belongs, outboard, allowing skipper and crew to keep far more power than they could on a narrower boat. Tufts is home to some dozen college regatta per year and has been chosen host site for the 2017 Fowle Trophy Regatta for the New England Intercollegiate racing championship next April. 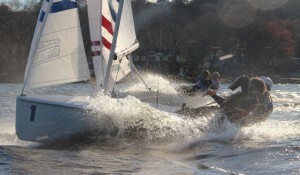 This May some 48 alumni teams will take part in a massive Tufts Alumni regatta.